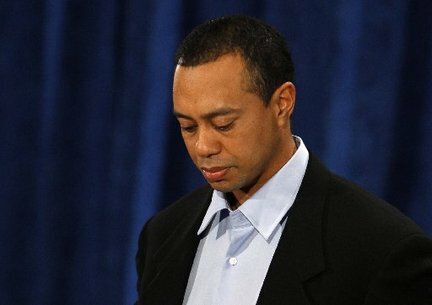 IN HIS FIRST PUBLIC appearance in three months, since a car accident on 27 November precipitated one of most spectacular falls from grace in sporting history, Tiger Woods said he was sorry for his infidelities and said he would continue to undergo treatment before one day returning to the game. “Now every one of you has good reason to be critical of me,” said Woods during a carefully managed press conference at the TPC Sawgrass clubhouse. “I want to say to each of you, simply and directly, I am deeply sorry for my irresponsible and selfish behaviour I engaged in.